Every day until November 4, a series of writers and thinkers will discuss the election over instant messenger for nymag.com. Today, Politico's Ben Smith and Robert Reich, former United States secretary of Labor and University of California, Berkley professor, discuss McCain "suspending" his presidential campaign, what the precise chances of a world financial crisis are, and whether Obama has distinguished himself in dealing with the economy. B.S. : You blogged the other day that Democrats "have no choice but to say yes" to the bailout the way it was put to them. Still true? R.R. : They have to say yes because Paulson and Bernanke are pointing a gun to their heads — as well as to Republicans' in Congress — telling them if they don't bail out Wall Street, the entire world economy will end. But Congress can and should put conditions on the bailout. B.S. : Wait though. Why say yes? Will the world economy end? R.R. : If nothing is done to rescue Wall Street — if there's no agreement on a bailout package, including tough conditions Wall Street must meet — there's a chance of a major meltdown. A chance. How much of a chance? I'd say 53 percent, give or take. Make that 54 percent. B.S. : So the gun is loaded. B.S. : Do you think the conditions that Dodd and Obama and others are talking about are hitting it right? 1. Government gets an equity stake in each company that seeks a bailout, proportional to the amount of bad debt the government is taking on. 2. Limits on executive pay. 4. Opportunities for homeowners to reorganize their own debts. I could go into more detail, but these are the essentials. B.S. : Do you see meaningful differences between Obama and McCain here? They're both talking about at least (2) and (3). R.R. : Obama laid out his conditions first. (McCain has been gyrating wildly on the whole bailout thing — first condemning it, then saying he had his own plan, then seeing Obama's conditions and essentially copying them.) Barney Frank and Chris Dodd are actually negotiating this for the Dems, and in effect for Congress. Their demands are similar. The question is whether Paulson and Wall Street will go along with the four conditions. B.S.:Whoa. 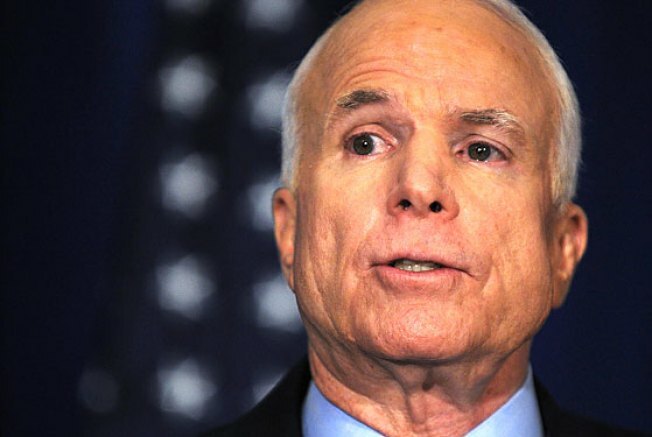 As we type: "Republican John McCain said Wednesday he was suspending his White House campaign and asked to put off Friday's presidential debate over the nation's financial crisis." Are he and Obama real players here? Can they be? They've felt very irrelevant. R.R. : They could be, and Dodd and Frank are very likely coordinating with Obama. I doubt McCain is coordinating with anyone. But if McCain is now calling for suspending all campaigning, including Friday's debate, he must sense that Obama is getting the upper hand in all of this. Obama's polls are rising because the public apparently believes he'll handle this crisis best. In other words, McCain's move has all the trappings of politics as usual. B.S. : Yeah, the only thing that's changed in the last 24 hours is the polls. The crisis isn't new. R.R. : Right. And McCain wants to stop Obama's momentum — just as he did after the Democratic convention with his surprise pick of Palin. Here's another McCain Surprise to stop the Obama momentum. But I don't think it will work this time. R.R. : The public (and the media) can see through it. With less than six weeks to go, it's patently absurd to stop campaigning. Plus, the financial crisis may last for many weeks — right through the election. So does that mean no more campaigning? B.S. : So how does Obama react? R.R. : If I were Obama, I'd call it for what it is — another McCain political ploy — and I'd say, truthfully, that this is precisely the time when candidates need to be heard on one of the biggest crises of our time. B.S. : You defended Obama's left flank, very effectively, in the primary. What do you think of where he is now on the issues you care about, like trade and health care? R.R. : The financial crisis has driven everything else out of the news. No one is talking about trade. No one is even talking about health care. By the way, I do like where he is on both. And I'm also very pleased by how specific and tough his conditions are with regard to the Wall Street bailout. As to "guarding his left flank," though, I wouldn't say that's been my job. Unlike every other candidate I've ever advised — and there have been a number — he doesn't think in terms of left or right. One last thought: A financial crisis of this magnitude has not occurred in more than 70 years — and it's happening under a wildly unpopular lame-duck president with almost no public credibility, six weeks before an election. If the nation can make sensible decisions now, I'd be surprised and impressed. If it can't, we're likely to be in big doo-doo, as one of our former presidents might have put it.